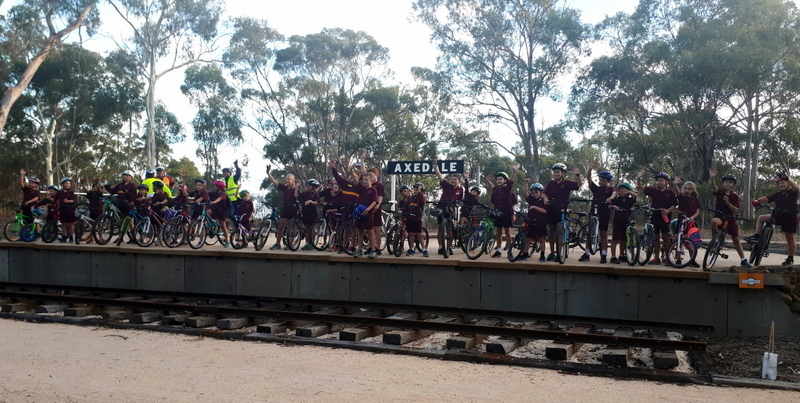 The National Ride to School day event for the Axedale Primary School each year involves one of their school’s favourite adopted ‘school facility’, the O’Keefe Rail Trail. This National activity provides an opportunity for students, parents and teachers to try riding, walking, skating or scooting to school as well as celebrating the regular walkers and riders. And Axedale school community really does get behind this National initiative. From this small rural school, students from all age groups were involved as well as teachers and parents plus the ride being assisted by Friends of the Bendigo-Kilmore Rail Trail members. At the early morning start time of 7:30am, from the designated Longlea Lane start point, this saw an excited bunch of older students ready to share the whole experience on the rail trail. As the ride group rode closer towards the school, the younger age students and parents joined the group at various points along the trail. The ‘official’ 2018 photo was taken at the recently constructed replica Axedale Railway Station platform on the O’Keefe Rail Trail, where the student’s enthusiasm for the morning’s ride overflowed!